Beyond Web Analytics-Episode 5 | Beyond Web Analytics! 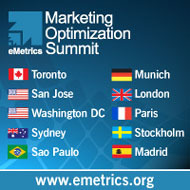 Join the Beyond Web Analytics team as we talk Test & Targeting with Brian Hawkins of Omniture. The conversation explores items for those just starting out with multivariate tests to practices and suggestions for advanced users as well. Be sure to use the comment section below to ask specific questions or suggestions for future shows. The Beyond Web Analytics podcast team has explored test and targeting best practices, but we would like to hear from you to find out not only any questions you may have or to share some thoughts on the podcast. This article was posted in Podcasts, Web Analytics and tagged Best Practices, Brian Hawkins, Podcast, Test & Targeting, Web Analytics. Bookmark the permalink. Follow comments with the RSS feed for this post.Post a Comment or leave a trackback: Trackback URL. If I were to start A?B or MVT for a website, which would be the starting point (for a e-commerce site). I am seeking this clarification as i need to compare diff designs. Like, will we be able to set up some KPIs for test that we conduct? Thanks for the question. What I would recommend is starting off with an A/B test to find out which design is optimal across the segments of traffic that come to the site. Once you have a winner from the A/B test, I would follow up with an MVT campaign to find out why a particular design won over the others. The results of your MVT will also provide a nice opportunity to apply the learnings to other areas of the site. Without knowing what the differences in the designs are, I would include all the KPI’s that you think can be affected by these different experiences. Since this is an e-commerce site I would include conversions, AOV, RPV, and total sales but also maybe repeat visits, page views, and time on site. Great podcast. We have been an Omniture client for the past 3 years; started with Site Catalyst and have been working with the T&T team over a year now. The tests we did together not only gave us the highest site conversion rates and increased lead numbers but also won us a Gold Ribbon award for best lead generation test. This year my goal is to run at least 1 test a month on our sites. Currently working on the plan where we lay out our business goals, take it to site goals level and determine how testing will contribute to that, and I’m really looking forward to that. If you read Avinash Kaushik’s Web 2.0 book or if you are familiar with the concept of an analytics continuum; starting with click stream analysis then moving on to testing, then to gathering customer’s voice and competitive intelligence to reach the “insight” that will help impact business decisions ( http://www.youtube.com/watch?v=sMwQN43fwoQ (Min 18:44)); it’s only natural that click stream analysis and testing build upon each other. I have a premonition that not very soon Omniture will start offering bundled packages of analytics and testing. Thanks for the comments. It would be great to see Omniture offer more bundles of their tools. It would really set them apart.